If you're one of the lucky (?) 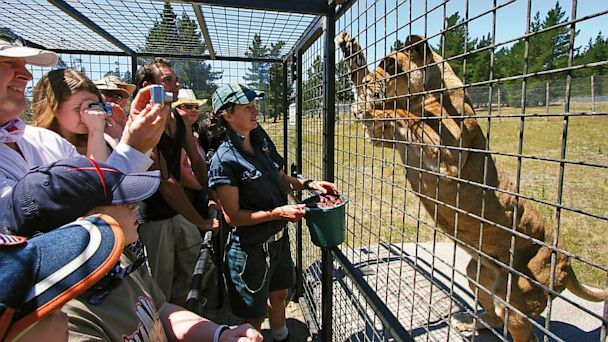 lions sent to live at the Orana Wildlife Park in Christchurch, New Zealand, you may well be looking at humans in cages, rather than the other way around. Finally. Planning a trip to Christchurch? Don't miss the world's first cardboard cathedral. Humans are caged in this zoo role reversal where lions clamber onto a moving enclosure to grab a better look at their visitors as part of the zoo's Lion Encounter experience. Take that, humans. Up to 20 tourists can squeeze in the specially designed cage, which is attached to a flat-bed truck. The truck and cage roll into the lion enclosure at feeding time and keepers feed the lions from within the cage. The lions crawl, climb and stand on the mesh cage, park officials said, giving visitors a chance to watch them feed in their habitat. The human cage departs once daily at 2:30 p.m and tickets are sold on a first-come, first-served basis for the first 20 buyers. The cost is NZ$30 (about US$23) and tickets can be pre-paid and reserved in advance.